Podia tabletop display is a unique image capsule and wall sign. Although the display is easy to use, there are a few helpful tips that help increase a restaurants sale. A common mistake, that is made in restaurant settings, is to set the display next to the condiments. However, this decreases the odds of the customer having to physically touch the display, which in turn makes them less likely to read the material. Instead, place your Podia display at the front or middle of your table. Secondly, take professional photos of your food. When a customer can see it visually, they are more enticed to want to order that specific meal. This works especially well if your restaurant is running a special. With this, increase gift card sales by displaying them to customers during their meal. Display your gift card promotion in a Podia capsule placed at each table, or on the bar, and sit back and watch your increase! Lastly, consider using target marketing by placing several different inserts in one Podia so that it is quickly interchangeable to any audience that enters your restaurant. 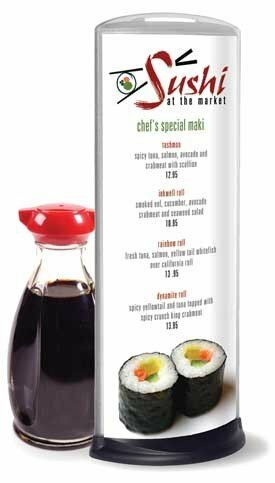 This makes the display quickly interchangeable allowing the message to accommodate any audience that enters your restaurant. These tips will be very helpful in making your Podia display help increase your restaurants sales. 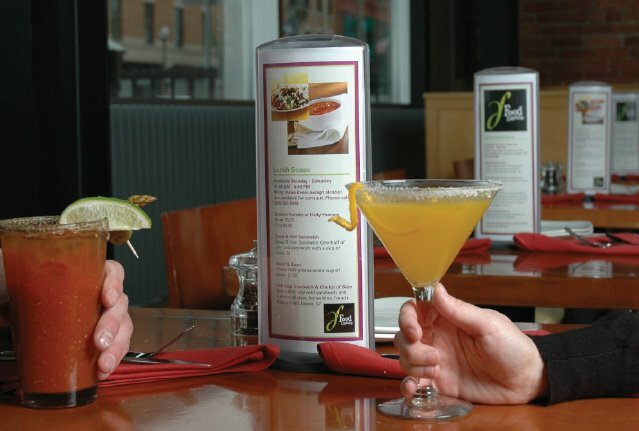 Podia is great for displaying menus, promotions, and special events going on in the restaurant. Podia is always useful in even the most basic ways, but if a restaurant can pin point the method to its madness, sales will start sky rocketing!